In the wee hours of the other morning, TW came up with an idea for my card. Surprise, surprise, she didn't forget it overnight. #senile She'd been seeing a design in the stores and in her head and wanted to recreate it with moi. Then she followed some steps to make sure our design would look it's best. 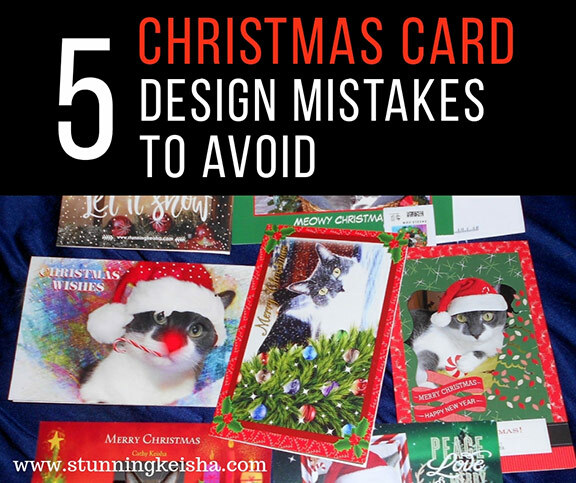 Go to the site you're looking to purchase the cards from, whether it be Zazzle, VistaPrint, Walgreens or someplace else and take note of the size of their cards. Once in your design program, set up a template/document that's at least half an inch larger on each side—instead of 5 x 7, make it 6 x 8—and at least 200 dpi. You want it at least two times up so it renders nice and sharp on the card. If you're simply using a photo from your camera that you've downloaded, again make sure it's high resolution. Likewise if you're using an image that you've created from a frame on one of the online apps that we use for Caturday Art. Some of those sites render all images to a certain size even if you upload a hi-res image. Remember, you can always shrink an image without losing clarity but you can't enlarge a lo-res image and expect your card to look sharp. correctly. Most of them, right? Those five mistakes you want to avoid? Don't use a design that's smaller than the card you're designing. You want your image to be at least twice the size of the card. 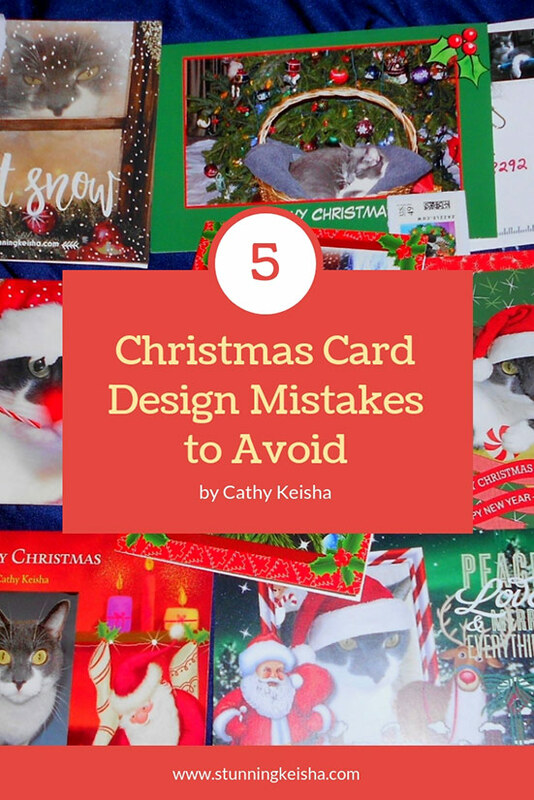 Don't design past the safety or crop lines of the card template. Don't use an inappropriate saying. If you have your kitty sitting in the manger with Mary and Joseph, you don't want your card to read "Jingle all the way." Don't use an image you don't own the license or copyright to. Images found on Google image search are copyrighted. Don't forget you can edit the card template you choose to suit your needs. You can change fonts, font size, color and location and, of course, the message. You can also add text or images. TW actually didn't know this the first couple of years we made my cards. A sixth one would be don't forget to crop the image so that the most important part of the image is nice and big and not covered by type. Cropping can turn a mediocre, clutter-filled image into a masterpiece. So back to my 2018 card, which I'm not gonna show you. HAH! It took TW longer to find the public domain background image she wanted than to create the image in Photoshop. To tell you the truth, she wasn't sure what she was looking for—until she found it. It was definitely an "Ah hah!" moment. This year, she didn't design the type on the front image of the card. Of course, after TW sends for my cards, she designs her own cards by grabbing one of Zazzle or VistaPrint's pre-made card templates and plopping the design into it. MOL! I don't leave her time for anything else. We like to use VistaPrint since you can first upload your image and see how it will look in all the cards which will make it easier to choose one. Seventy-five percent of you guys don't need any hints, tips and tricks but this post can serve as a checklist for those designing their cards for the first time. Has your human designed your cards yet? It's surprising how many people still don't know some of these tips... but some really don't! Nice tips :-) I love your cards. They look very festive and pretty! Those are really good tips CK and very timely too! All great pieces of advice - thanks! 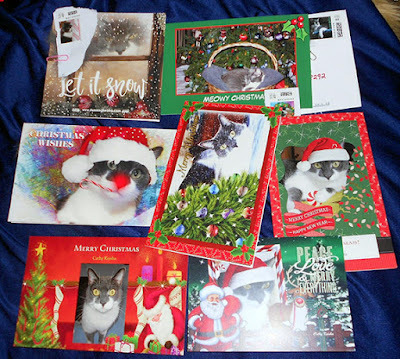 The cards are absolutely darling and so is the cat. 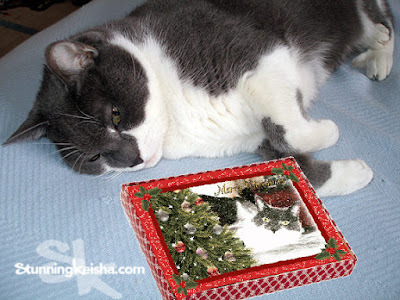 My assistant flaked out on sending cards the last few years, but we are hoping she gets her act together this year. But no sign of a card yet. Those are good tips, CK. I always used Vistaprint and found them good. I buy my cards from Cats Protection now to support them, which reminds me I need to get them ordered. Great tips! Your cards always look amazing, CK. I haven't even thought about ours yet...yikes! TW has all my admiration! This post is so informative. I wish you would consider starting the CK School of Photoshop. Hugs n purrs from AngelSmokey8, Butterfly ��, and Peek a Boo! Great tips, CK. We bet folks are happy to have these, so that they can make fantabulous cards! We have a fight with Christmas cards every single year. The dimensions are never the same. We usually end up going to CVS for ours so we can let them run a test card. LOL! Don't forget to check spelling on even the most obvious of words. Glogirly once misspelled Christmas on a card and, worse yet, misspelled her own name on a business card. LOL! FGantastic info and much needed, CK. Mom is going to use a picture done up for Christmas for her Christmas Card. We need all the help we can get. We always fiddle for a while to get cards right. These are good tips to avoid goofs! we are late catching up as just finished work but back to say thank you for the Thankful Thursday hop visit!